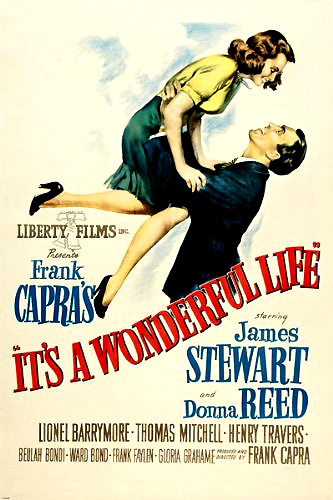 It's A Wonderful Life (1946), originally made for Liberty Films, is one of the most popular and heartwarming films ever made by director Frank Capra. Frank Capra regarded this film as his own personal favorite - it was also James Stewart's favorite of all his feature films. The film's screenplay (credited as being written by Frances Goodrich, Albert Hackett, and Capra himself, with additional scenes by Jo Swerling) was based on "The Greatest Gift," an original short story first written on a Christmas card by Philip Van Doren Stern. Uncredited for their work on the script were Dorothy Parker, Dalton Trumbo, and Clifford Odets. It is actually a dark, bittersweet post-war tale of a savings-and-loan manager who struggles against a greedy banker and his own self-doubting nature in a small town. Earnest do-gooder George Bailey (James Stewart) recognizes his life as wonderful and truly rich, even in its humdrum and bleak nature, only after suffering many hardships, mishaps and fateful trials (including compromised dreams of youth to leave the town and seek fame and fortune, other sacrifices, dismay, losses and the threat of financial ruin, and suicide). He is given encouragement by a whimsical, endearing, trainee-angel named Clarence (Henry Travers). The story turns Dickensian (similar to A Christmas Carol, although told from Bob Cratchit's point-of-view rather than from Scrooge's) when the hysterical, despairing, and melancholy family man is shown what the small town (Bedford Falls, now renamed Pottersville after the town's evil tycoon) would be like without him. It's a frightening, nightmarish, noirish view of the world (at Christmas-time) that brings him back from self-destruction. He returns to the idyllic, small-town world that he left, with renewed faith and confidence in life itself. Hence, the film's title: It's a Wonderful Life. The plot of the film was copied in the rags-to-riches fantasy storyline (also with a guardian angel played by Michael Caine) of Disney's Mr. Destiny (1990), starring James Belushi, and in Brett Ratner's The Family Man (2000) with Nicolas Cage. The famous "Pottersville" alternate reality scenes were also referenced in Robert Zemeckis' Back to the Future Part II (1989), in which the small town of Hill Valley was transformed into a Las Vegas-like Babylon in 1985, with young Marty McFly (Michael J. Fox) in the role of George Bailey. Please God, something's the matter with Daddy. Please bring Daddy back. The camera shot dissolves slowly upward into the star-filled, dark night sky where two pulsating galaxies of light come into view. Two heavenly angels are conversing together. They have heard the prayers for the film's hero, George Bailey (James Stewart), a man overwhelmed by his problems. Every time one of the heavenly voices speaks, the stars twinkle. In this cosmic fantasy sequence, Angel Joseph tells Angel Franklin that they will appoint a guardian angel for George: "Looks like we'll have to send someone down - a lot of people are asking for help for a man named George Bailey." But the only angel available is Clarence Oddbody (Henry Travers), Angel Second Class, a sweet but inept apprentice angel who hasn't yet earned his wings. Clarence has "got the IQ of a rabbit," but "he's got the faith of a child." The apprentice is summoned, and portrayed as a streaking star that appears before the brighter angelic stars. Clarence asks: "You sent for me Sir?" Before being dispatched, Clarence is told that George is despondent and considering suicide, "throwing away God's greatest gift," his life - he obviously needs angelic assistance. Clarence is promised: "You do a good job with George Bailey and you will get your wings." Before Clarence is given a chance to become a full-fledged angel and sent to Earth, the heavenly powers show, in flashback, background on George's life from boyhood, to provide Clarence with important information about why George is so despairing. Bedford Falls comes slowly into focus. It is the year 1919 and young native George Bailey (Bobbie Anderson) is 12 years old - born, raised, and educated in Bedford Falls. George and a group of friends are sliding down an icy hill on shovels onto a frozen pond. When his younger kid brother Harry (George Nokes) slides past the safe area and plunges into the freezing water at the end of the icy pond, George jumps in after him and saves him from drowning by forming a human chain, but his heroics cause him to catch a bad cold. From the resulting infection, he goes deaf in his left ear. In the afternoons, George works at the local drugstore owned by "old man" Mr. Gower (H. B. Warner). Walking to work with his friends, they stand in awe and watch a horse-driven, hearse-like carriage pass by, carrying Mr. Henry F. Potter (Lionel Barrymore), "the richest and meanest man in the county." At the store, he talks with a flirtatious eight year old Violet Bick (Jeanine Anne Roose) who orders candy at the counter and vies for George's attention. Also there is young Mary Hatch (Jean Gale), the childhood sweetheart he will eventually marry. Mary orders a chocolate sundae, but rejects George's offer of coconuts on top. George tells "brainless" Mary that cocoanuts come from Tahiti, the Fiji Islands, and the Coral Sea. Obviously, he wants to explore and see the world, bragging about being nominated as a member of the National Geographic Society. George Bailey - I'll love you till the day I die. She already knows that George is the only man she'll ever love, but he doesn't hear her. He boasts that on his adventures, he plans to "have a couple of harems and maybe three or four wives." While finishing fixing her order, George discovers a recent telegram to druggist Mr. Gower informing him of the tragic death of his son Robert, due to influenza. Distraught over the news and drinking as a result, Mr. Gower mistakenly mixes a pill prescription containing poisonous cyanide. Gower gives the order to George for an emergency delivery. Although obedient and diligent, George realizes that the prescription is fatal, but he faces a dilemma - should he deliver it? As he leaves the store, Mary is still sitting at the soda fountain counter, watching him as he dashes off. Not knowing what to do, young George spots a sign with the words: "Ask Dad - he knows." Young George runs to his dad Peter Bailey (Samuel Hinds) for advice. But his father is busy in the Bailey Bros. Building and Loan Association building, confronting Potter in his office. George's Uncle Billy (Thomas Mitchell), (Peter Bailey's brother), known for wearing strings around his fingers to prevent absent-mindedness, prevents George from interrupting, but is called away. George enters his father's office and listens to the conversation between his father and Potter. The contrast between Bailey and Potter is clear - Potter wears black, sits in a wheelchair, and is a "hard-skulled," villainous, miserly banker demanding immediate payments and whose consuming goal in life is to destroy the Building and Loan. And Bailey is a champion and defender of the rights of the little man, refusing to foreclose on the mortgages of families in town. Potter insults Bailey: "Are you running a business or a charity ward?" and young George stands up and comes to his father's defense when Potter calls him a failure. His father rushes him out of the office without giving him a chance to ask about the pills. George returns to the store with the undelivered capsules. Before learning of the mistake, Mr. Gower angrily slaps George's sore ear for disobediently not delivering the order, although the boy describes the druggist's error: "You put something wrong in those capsules. It wasn't your fault Mr. Gower." When the old man tests the pills and learns the truth, he breaks down and tearfully embraces George, profusely begging him for forgiveness. George promises never to tell anyone about the mistake. The film moves ahead to the summer of 1928. George has grown up into adulthood and as a young man, he finally has his chance to get out of tiny Bedford Falls before entering college. He is about to leave for Europe on an exotic trip aboard an ocean freighter to see the world. He is in a local luggage and bags store purchasing a suitcase. With his hands outstretched, the moving image of George is suddenly stopped on the screen by the angels, as they inspect and comment upon it. When the flashback continues, George insists that his suitcase must be big enough "for a thousand and one nights with plenty of room here for labels from Italy and Baghdad...." He is presented with a second-hand bag with his name inscribed on it, a present from his ex-boss Mr. Gower. On the streets of town, townspeople kid with him about his upcoming trip. With friends Ernie (Frank Faylen), the taxi driver, and Bert (Ward Bond), the cop [It has been hypothesized that their names were derived from the Bert and Ernie characters on Sesame Street], he calls himself "a rich tourist" and asks to be driven home in style. Just then, George sees another childhood friend, Violet (Gloria Grahame), the town flirt. He compliments her on her summer dress. Coquettishly, she shrugs: "What, this old thing? Why, I only wear it when I don't care how I look." As she walks away wiggling her hips, Violet stops traffic and gets them all to crank their gaze in her direction. Oh he's a sick man. Frustrated. Sick in his mind, sick in his soul if he has one. He hates everybody that has anything that he can't have. It's us mostly, I guess. Oh well, you know what I've always talked about. Build things. Design new buildings. Plan modern cities. I-I couldn't face being cooped up for the rest of my life in a shabby little office. I'm sorry Pop, I didn't mean that. It's this business of nickels and dimes, and spendin' all your life tryin' to figure out how to save three cents a length of pipe. I'd go crazy. I -, I want to do something big, something important. George doesn't wish to demean his father's work, but explains that he wants to get away and achieve financial/worldly success: "I just feel like if I didn't get away, I'd bust." His father demonstrates his understanding: "This town is no place for any man unless he's willing to crawl to Potter. Now you got talent son. I've seen it. You get yourself an education and get out of here." George compliments his empathic father: "Pop, you want a shock! I think you're a great guy." At Harry's 1928 high-school graduation party, George is heartily greeted by old friends including Sam Wainwright (Frank Albertson), a recent college graduate. Sam is known for prefacing conversations with "Hee Haw" and pretending to have floppy donkey ears. Violet approaches and offers her dance card to George: "What am I bid?" But George slights Violet when he is interrupted by Mary Hatch's brother Marty Hatch (Harold Landon) - they are all together again for "old home week." Marty suggests that George dance with his "kid sister Mary" to give her "the thrill of her life." Violet reacts with mock surprise as George turns to look for Mary. His tall figure makes its way through the crowd to find her. When he sees the grown-up 18 year-old Mary (Donna Reed), the first time they have met since they were childhood friends, she looks exquisitely beautiful in a close-up and he is visibly impressed with her. Although Mary is listening to an obnoxious suitor named Freddie (Carl Switzer, Our Gang's 'Alfalfa') tell her a boring story about an experience he has had, she immediately turns away and shows an interest and fondness for George. He takes her away from her partner and they go off dancing together after George tells Freddie off: "Oh, why don't you stop annoying people." Beginning a heart-warming set of dreamlike sequences, George courts his childhood sweetheart. At the party, they enter a Charleston dance contest, while unbeknownst to them, the jealous rival Freddie plots his revenge. With the turn of a key and the push of a button, the gym dance floor is opened up, revealing a swimming pool underneath. When the floor separates beneath them, they are so carried away with their hectic Charleston dancing that they don't notice - and they plunge backwards into the pool. Soon, everyone joins them in the water, including the school principal. George: You, you look wonderful. You know, if it wasn't me talkin', I'd say you were the prettiest girl in town. George: Well, I don't know. Maybe I will say it. How old are ya, anyway? George: Eighteen! It was only last year you were seventeen. George: Oh, no, no! Just right. Your age fits ya. Yes sir. You look a little older without your clothes on. I-, I mean without a dress, you look older. On their way home while strolling along the street, they pause in front of the old deserted Granville house, and the gawky George accidently steps on her bathrobe belt, the pretended "train" of her dress. She stops so that they can pretend a chivalrous encounter in a dramatic game. As a courtly lady, she extends her hand for a kiss from her courtier. He approaches closer to her, intending to give her a real kiss, but she coyly and slowly turns away from him, walking away and continuing to sing "Buffalo Gals." George: What is it you want, Mary? What do you want? You-you want the moon? Just say the word and I'll throw a lasso around it and pull it down. Hey, that's a pretty good idea. I'll give you the moon, Mary. George: Well, then you could swallow it. And it'll all dissolve, see. And the moon beams that shoot out of your fingers and your toes and the ends of your hair...Am I talking too much? George: You want me to kiss her, huh? Man on Porch (as he exasperatedly steps inside his house): Ah! Youth is wasted on the wrong people! George: Hey, hey, hold on, hey, mister! Come on back out here! I'll show you some kiss that'll put hair back on your head. Just then, George inadvertently steps on Mary's bathrobe again and she accidentally loses it. She jumps into the hydrangea bushes to hide. Aroused by her predicament, he hesitates to throw her robe to her and teases her in a good-natured way, calling it "a very interesting situation." Mary begs for her robe back as he circles the bush with the bathrobe in his hands. George's imaginative contemplation of possibilities is interrupted when a car roars up the street with Harry and Uncle Billy. He abruptly leaves after receiving the tragic news that his father has had a stroke. The beautiful harmony of their mutual attraction is shattered. The last shot of the scene is a long, sustained close-up of Mary (with a mixed expression of sadness, concern and disappointment). She watches the car drive off. Mr. Bailey death means that George's dream of traveling abroad to Europe for the summer before college is short-circuited. He must handle the affairs of his father's business in the few months following his father's death. In a meeting of the board of the Bailey Building and Loan Company that gathers to vote on its future and to choose a successor to Mr. Bailey, George listens to Mr. Potter (one of the board members) present a motion to dissolve the Building and Loan Association in a bold-faced attempt to shut it down. Although Potter calls George's father "a man of high ideals," he criticizes Peter Bailey's business sense - he's "not a business man - that's what killed him," maintaining that the company was always a losing proposition. The crotchety old Potter believes that the loan policies of the company only produce: "a discontented, lazy rabble instead of a thrifty working class." Potter complains about a few idealistic, "starry-eyed dreamers like Peter Bailey (who) stir 'em up and fill their head with a lot of impossible ideas." Do you know how long it takes a working man to save five thousand dollars? Just remember this, Mr. Potter, that this rabble you're talking about. They do most of the working and paying and living and dying in this community. Well, is it too much to have them work and pay and live and die in a couple of decent rooms and a bath? Anyway, my father didn't think so. People were human beings to him, but to you, a warped, frustrated old man, they're cattle. Well, in my book, he died a much richer man than you'll ever be. George is committed to keeping alive the company as the only alternative to allowing Bedford Falls to fall completely under the ownership of greedy and unscrupulous Mr. Potter - the only source for borrowing money. This town needs this measly, one-horse institution if only to have someplace where people can come without crawling to Potter. Potter calls George's ideals "sentimental hogwash." The board votes not to sell out to Potter but to keep the Bailey Building and Loan Company under one condition - if George is kept in charge as Executive Secretary to succeed his father. When they suggest that absent-minded Uncle Billy run the company - an unworkable alternative, George realizes his opportunities to go to college and study architecture are closing down, crying: "This is my last chance." But then, he again agrees to sacrifice and sidetrack his personal dreams as a victim of circumstance. He will remain in Bedford Falls to operate the company, inherit the responsibilities of running the loan company, and instead send his younger brother to college, using his own college savings. Harry: Old George Geographic Explorer Bailey. George: Old Professor Phi Beta Kappa All-American Bailey. Unexpectedly, Harry is accompanied by his new bride Ruth (Virginia Patton), and George learns of Harry's promise of profitable work (out of town) in the research business for his father-in-law's glass factory in Buffalo. In a close-up of George's despairing, frustrated and dispirited face, he suddenly falls silent, realizing that he is doomed to stay in town. George is left alone as Harry returns to the train for his luggage. His dreams of escape and adventure are dashed, but he keeps his bitterness and discouragement to himself.